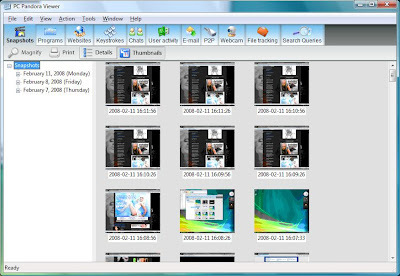 PC Pandora is a computer monitoring software for Windows XP/Vista which will record all your activity done on your computer allowing parents to keep track and monitor their kids activity online and offline. This is done by logging keystrokes, sniffing passwords from IM clients like GTalk, Yahoo messenger, MSN messenger , screenshots , emails , downloads etc and the information will be sent to parentâ€™s email using the inbuilt IRIS feature. Pandora Corp. has announced free License and Registration key for their flagship computer monitoring software PC Pandora. PC Pandora is a great software for parents to monitor their kids so that they can be quite safe online. To get the Free License, visit www.pcpandora.com and use the License code PCPANDORAHOLIDAY and get the PC Pandora version 5.2 as absolutely free download. This free giveaway is probably because of new PC Pandora 6.0 which will be releasing in early 2009 and will have new features like real time remote monitoring and web based subscription service Pandora LIVE. To instantly start downloading go to http://www.pcpandora.com/order and use the promo code PCPANDORAHOLIDAY and enter your name and email address to confirm. PC Pandora 5.2 currently sells for $69.95 . To get it free download it before 31st December, 2008.